WHAT'S NEW ON THE HOMESTEAD? Chickens are laying eggs galore, projects around the farm, the vegetable and herb gardens are planted, baby Iseabail has taken charge of the pasture...just to name a few things! It has been a very busy Spring at the Buck 'n' Mule Farm. At first, it didn't seem as if we would have a Spring with the threat of snow into April. Until mid-May we were still having frost warnings at night. For Central New York, this is typical weather. During the intermittent breaks in the cold, rain and snow we took inventory of the projects that we wanted to accomplish this year around the farm. Number one on the list was to restructure the aisleway from the barn through the woods to the back pasture that we use for summer turnout. It was functional, but needed a major overhaul for the animals. It was too narrow to drive the tractor or 4 wheeler down, it went down a hill, across a creek and then up a short incline to the pasture. Mud was a constant problem with the creek and the way the drainage was. Buck called his friend and discussed what he wanted to do to change the layout of the aisleway to make it more accommodating and functional. It needed to be wider so we could maintain it with the tractor, it needed to be graded to have the runoff drain properly and it needed a culvert installed to alleviate the constant mud of the creek. I just love what can be accomplished with a bull dozer! 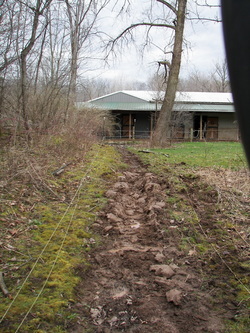 We had the renovation complete and Buck installed new fencing by the time Wakan and Clover came home from the trainers. Now with that project completed, it is time to turn our attention to baling hay. Hay wagons need to be repaired, the hay barn needs to be cleaned. Now I know where the saying "You gotta make hay while the sun shines" came from! 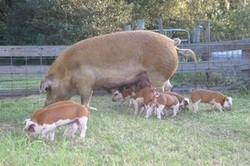 With all that is going on this Spring, we decided to not add getting pigs (see the March Issue for "The Heritage Pig Adventure") for the first time to the mix. We are not set up for fencing for them or shelter. It is one thing we are going to wait another year to think about. ​It is time to turn our attention to hitting the trails and going riding and enjoying our mules and horses! Who knows what other adventures may be waiting for us this Summer! Hard working muscles, long days on the trail, aches and pains…and that’s ME I’m talking about! Barn chores, gardening, hay season, trail riding…all wear on my muscles and joints. When my muscles ache and I’m sore, I reach for my Absorbine® Veterinary Liniment Gel. Ingredients include: Calendula, Echinacea and Wormwood combined with natural menthol and herbal extracts such as witch hazel and spearmint leaf. I love Absorbine® Veterinary Liniment Gel for myself, my family and my equines. This liniment is a powerful muscle, joint and arthritis pain reliever. Menthol loosens stiff joints and reduces swelling. A convenient gel that once applied has a warming sensation that feels like it is penetrating deep into achy muscles and joints. After the deep penetrating warmth, it has a cool refreshing quality. A must have in your saddlebag, at the barn or at home. Note: This is not a paid advertisement. This is review is based on my own personal use and experience. 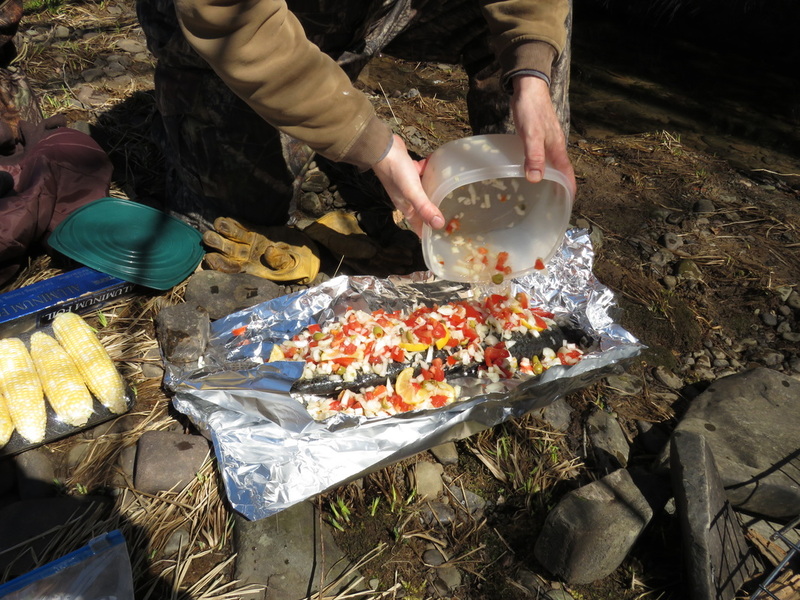 Read Fishing for Answers for our Float Trip with Strike Zone Charters to catch the Steelhead for this delicious lunch! 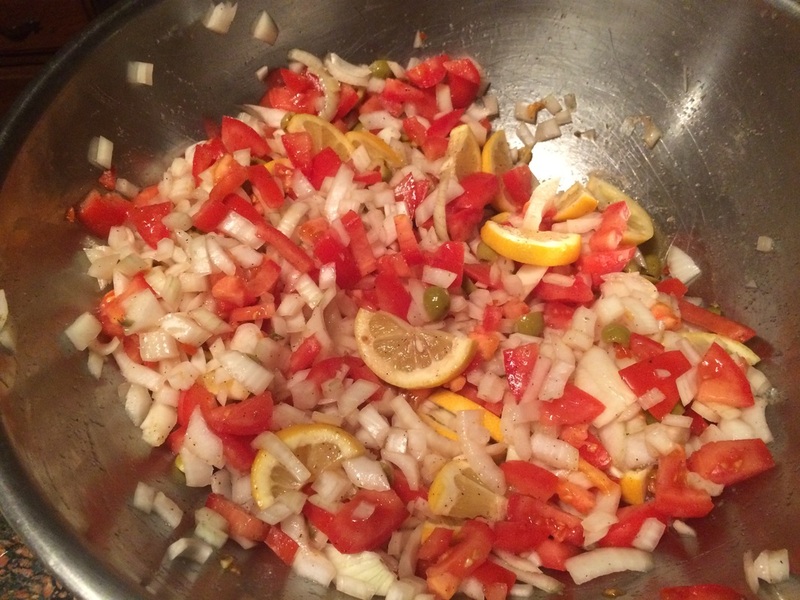 Mix vegetables and seasonings in a large bowl. Stuff fish with prepared vegetables. 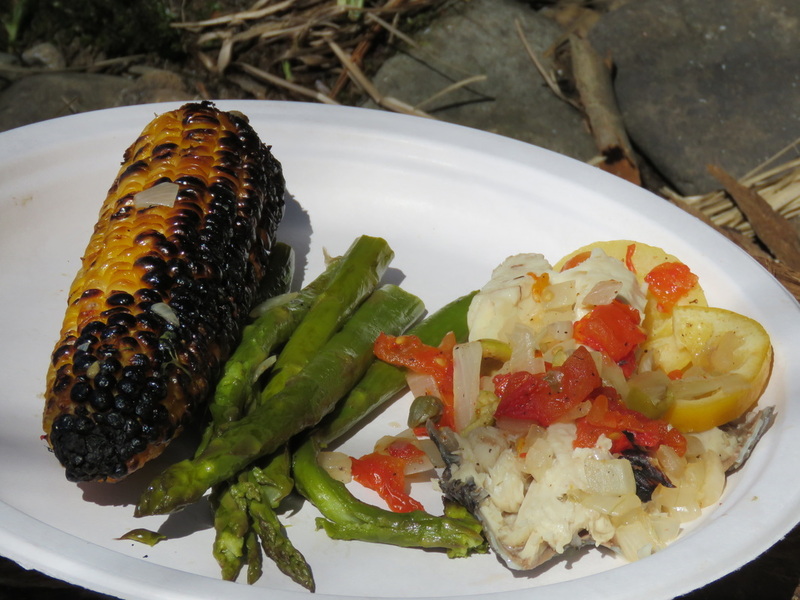 Easy enough to do at home, or to take with you for your own shore lunch or picnic. Vegetables can be prepared ahead of time and placed in container in cooler to take with you once you’ve caught your fish. 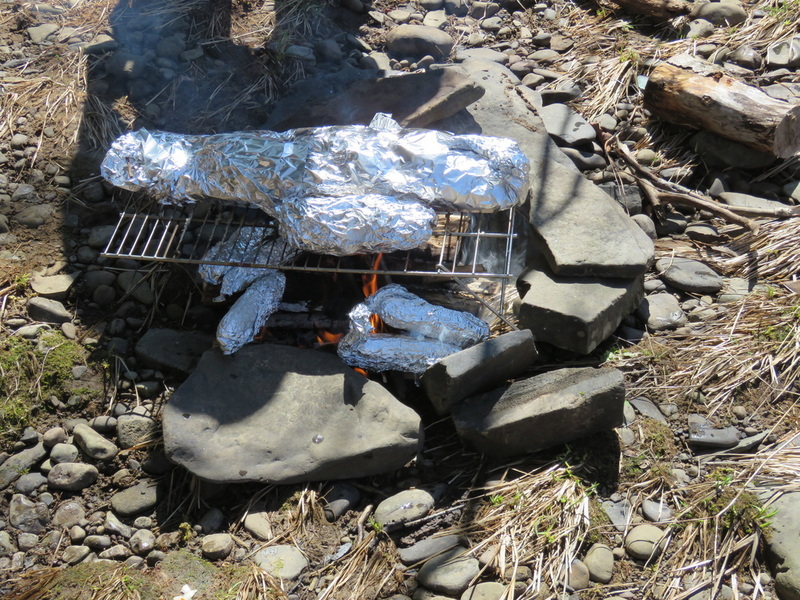 Throw your heavy duty aluminum foil and olive oil in a backpack with some plates and utensils and head for the river. Always be mindful of the footprint you leave on nature. Carry In, Carry Out! Make sure if you are not cooking on a grill, to heed any fire warnings for open fires in your area, before making one. Mix vegetables and seasonings in large bowl. Taste to see if it is to your liking. Set aside. Clean and scale fish. To scale fish, hold cleaned fish under running water and run blade of knife against (opposite direction the scales lay) the scales. Heat grill so grates are hot. Rub olive oil on cleaned, scaled fish. 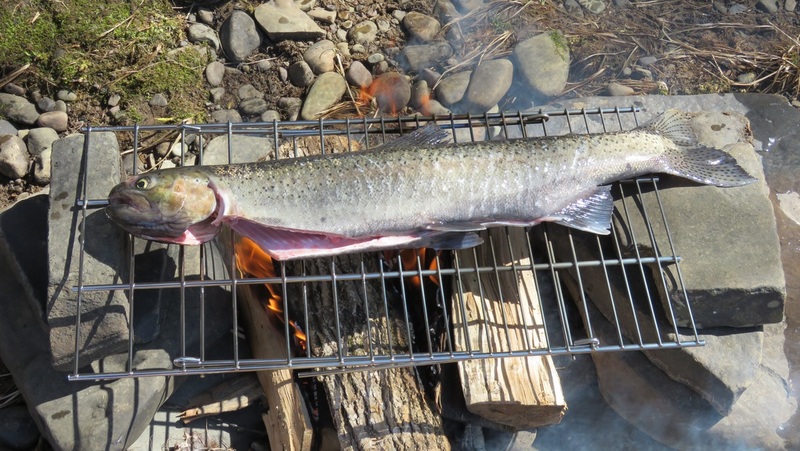 Put fish directly on grill to sear only (not to cook). ​Using 2-3 layers of heavy duty aluminum foil, tear off enough to be able to wrap completely around stuffed fish and to fold over ends to seal. Place seared fish in center of heavy duty aluminum foil. Take vegetable mixture and stuff fish. Put remaining vegetable mixture on top of fish. Pull edges of all foil layers up around the fish and vegetables and fold over on top and sides to seal. Make sure foil is sealed well! Place on grill on medium heat. Cook 10 minutes. Flip entire foil package of fish and vegetables over to other side, being careful not to have folds come open. Cook approximately another 10 minutes. Fish is done when flakey. BE CAREFUL when opening foil – Steam will be extremely hot and can burn you. ​This recipe is great as an appetizer or as a main course. Click on photo above for a printable version of this recipe. Each month we will share ways on how to safely use essential oils on your equines and your other pets. These are recommendations and not all inclusive uses of essential oils for your animal. Remember, all animals are individuals - so observe their behavior as you use essential oils (or anything) to see how they react to them. As a recap, before consuming any essential oils, make sure they are therapeutic grade and from a reputable company. Refer to the February Issue for information how all essential oils are not created equally. Always check the label of the individual oils for directions pertaining to that specific oil. For purposes of this article, we will only discuss the use of Young Living Essential Oils. Before using on children, or if pregnant, please consult your physician. When using essential oils for consumption, it is important to remember that a little goes a long way. For people, it is usually sufficient to add just 1 drop of essential oil to 1-4 cups of water before drinking. As an aside, the essential oils can also be added to rice milk or almond milk, for variety. From the Animal Desk Reference by Melissa Shelton, DVM, this month we will discuss species specific recommendations. A good reminder is to refer to the May Issue - Part 1 to get started before using the oils in your animals' water. Birds: Birds generally have a poor sense of taste, and it is quite easy to add essential oils to their drinking water. Care must be taken for birds who bathe in their water, and careful monitoring of water intake is important. In general, 1 drop per liter of water is commonly used. Chickens and Poultry: Chickens are much less able to bathe in their drinking water based on the water dispensers used by most farms. Many more “hot” oils have been given via drinking water to flocks for various conditions. 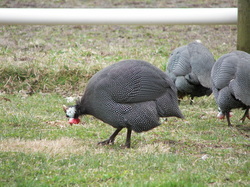 This is likely the easiest method for administration to flocks of chickens, turkeys, pheasants, etc. Care must be taken, as high concentrations of essential oils may damage plastics or certain components of automated systems. Starting with low amounts, and gradually increasing the concentrations is recommended. Knowing how much water your flock generally consumes on a daily basis – BEFORE adding essential oils to the water supply is crucial. Recommendation: 1 drop or more of Purification Essential Oil Blend or Thieves per liter of drinking water – improves health, immune system, replaces medicated feeds. 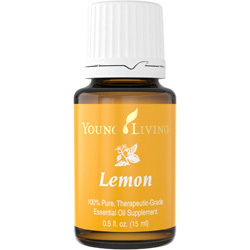 Young Living’s Lemon essential oil contains the naturally occurring constituent limonene, Lemon is a key component in many popular essential oil-infused products. Lemon is used worldwide in cleaners and soaps for its refreshing scent. Use for energizing, cleansing, or circulatory support. Citrus oils, such as Lemon, may cause photosensitivity when used on the skin. Avoid direct sunlight and UV rays after application to skin. See label for use. Anxiety: Diffuse or inhale; Apply topically - massage into the skin, Apply to back of neck or temples. Colds: Diffuse. Inhale from water vapor. Apply topically to throat, temples, forehead or sinuses. Depression: Diffuse. Inhale directly. Apply topically to forehead. Add to massage or bath. Fever: Diffuse. Apply Topically to back or to bottoms of feet. 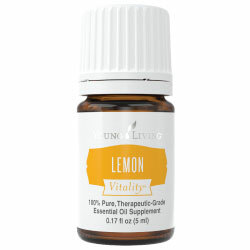 Young Living's Lemon (Citrus limon) Vitality™ can add a bright, dynamic flavor to many dishes. Its versatility in sweet and savory recipes is what makes this fruit a popular item in kitchens around the world. Use Young Living’s Lemon Vitality™ essential oil to add flavor to savory foods like fish and chicken or sweet foods like pastries and cakes. Lemon Vitality™ oil has a bright taste you’ll want to keep on hand for almost anything you whip up. Instead of zesting or juicing, use Lemon Vitality™ for a convenient way to use this great flavor. Start small with a toothpick dip or a single drop of oil. 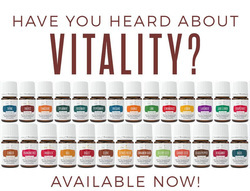 What is the difference between Young Living Essential Oils and their Vitality™ Line? The Vitality ™ oils aren’t really new. The labels are, yes, but in reality, these are oils that Young Living was already selling. What’s setting them apart is that these ones are labeled for internal usage whereas the regular essential oils are labeled for aromatic and topical usage. If you’re wondering, that means that, yes, they are the exact same oils. For example, Lemon Vitality™ essential oil is exactly the same as regular Lemon essential oil. But, because of FDA’s regulations on essential oils, they must be marked separately. Young Living USB Diffuser. Use in any USB plug, on your laptop, in your car, anywhere! Over the years I have tried just about every type of diffuser out there. Clay, Cotton, Felt Pads, Ceramic, Cotton Balls to name a few. None of them gave me the lasting results I was looking for or the ease of use. Clay and Ceramic are inconsistent at best. Cotton, Felt Pads, Cotton Balls were not only not what I was hoping for results of fresh, clear aromas, they needed to be replaced frequently. This YL USB diffuser is the best diffuser I've ever purchased that was not water based. It comes in Black, Pink and Purple and all can be purchased from the Wild Heart Mustangs™ Shop. Perfect for adding flavor to your favorite foods or using as dietary supplements, the Vitality™ line of dietary essential oils gives you the freedom to share and explore some of our best-loved essential oils in a variety of nutritious and delicious ways. We invite you to discover Vitality™—for food, for family, for life! Cats: Cats are less likely than other animals to consume essential oils within their water. The key with cats is to start with extremely small amounts (toothpick dips), to always offer an alternate water source for drinking, and to very gradually increase concentrations. It is important to note that if a cat refuses to drink one particular essential oil, it does not guarantee the refusal of others. Most cats are unlikely to progress to a concentration stronger than 1 drop per liter of water. Recommendation: Start with toothpick amounts, then gradually increase the concentration. Use mild, “cat friendly” oils such as Citrus Fresh when selecting oils to add to their drinking water. Dogs: Dogs are much easier to work with than cats. Starting with small amounts and gradually increasing the concentration is still advisable, along with careful monitoring of acceptance and water intake. A concentration of 1 drop per liter of water is average. Recommendation: Peppermint, Citrus Oils – start with 1 drop per liter, then gradually increase if needed and tolerated. Horses and Larger Animals: These animals almost prefer essential oils in their water. 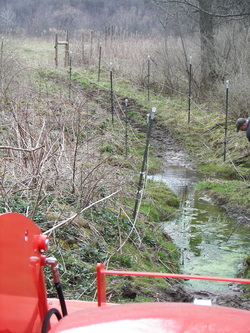 Often many drops can be added to a trough. Start with 5 drops, and gradually increase based on responses. Agitating the water’s surface after the addition of oils can help to disperse them. For a horses water bucket (5 gal) try 1-3 drops of essential oils. Recommendation: Peppermint, Lemon and other oils are enjoyed. 3-5 drops or more can be added per 50-100 gallons of water; or 1-3 drops per 5 gallon bucket. Peppermint on hot days is greatly enjoyed by not only horses, but also cattle and other large animals. 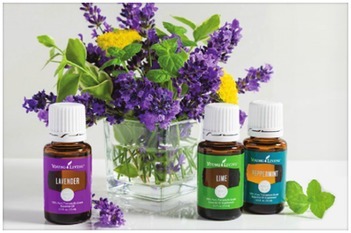 Mary Lainhart is a Young Living OIls independent distributor because after years of her own successful use of them, she's confident of the purity and quality of Young LIving products.​ The Everyday Oils™ collection is the perfect beginner's kit, containing ten of Young Living's most popular and versatile essential oils. This kit will become a useful part of your day, everyday. Visit the Wild Heart Mustangs™ SHOP to purchase and read detailed descriptions of each Young Living oil and blend. Lemon essential oil is also an effective disinfectant. It is antiseptic, antifungal, and antiviral. Lemon helps with respiratory conditions, congestion and infections. It helps purify water and is especially good in water buckets when traveling, providing your animal enjoys the taste. When travelling or taking your horse on the trail, keep your horse hydrated by adding a few drops of Lemon Vitality™ to your horse's drinking water. (Be sure to try the essential oils prior to leaving home, so you know what your horse likes to encourage them to drink). Lemon has been shown to be a deterrent for strangles in equines when diffused in the barn. The fragrance of lemon is very uplifting. Citrus oils, such as Lemon, may cause photosensitivity when used on the skin. Avoid direct sunlight and UV rays for up to 12 hours after putting citrus oils on the skin. See label for use. The information contained on this website is not meant to diagnose, treat, cure, or prevent any disease. The information on this website represents what I have chosen to do to take charge of my own personal health and that of my family. Statements on this website have not been evaluated by the Food and Drug Administration. If you are pregnant, nursing, taking medication, or have a medical condition, consult your physician before using these products. Information found on this website is meant for educational and informational purposes only, and to motivate you to make your own health care and dietary decisions based upon your own further research and in partnership with your health care provider.